This is my fourth map book. With the Sesquicentennial in full swing, I decided to cover the period between the battles of Gettysburg and the Wilderness. The resulting book, published in 2013, ran longer than I had expected. It contains 223 pages with 87 full-color maps. 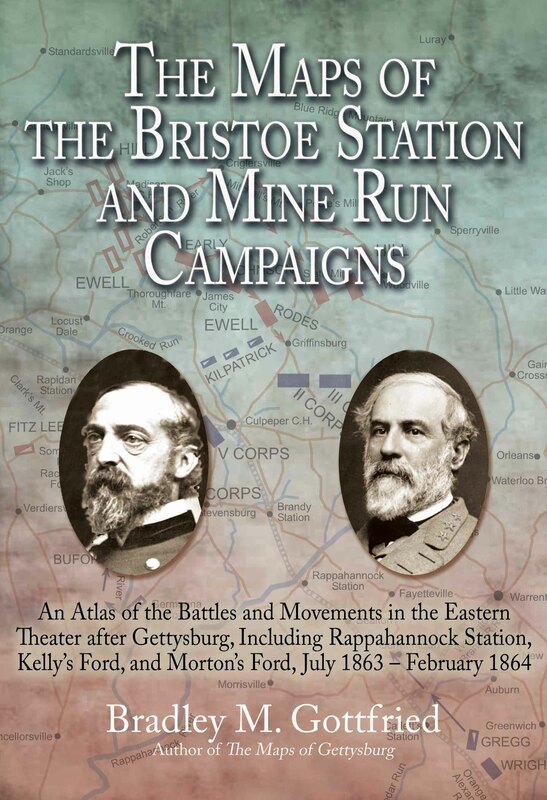 The book is dividing into two, almost equal sections: Bristoe Station Campaign and Mine Run Campaign. I also cover the action at Morton’s Ford in early February, 1864. As with the other map books, there are separate sections for: endnotes, order of battle, bibliography, and index. The book retails for $34.95. I am selling the book for $30.00. This was a period that I did not know much about. I don’t think that I am the exception here. I knew of Bristoe Station and Mine Run from my two brigade-level histories, but I never really spent the time delving into the “whys and wherefores.” I had heard of the battle of Rappahannock Station, but except for hearing that this was a dramatic Confederate defeat where two brigades were destroyed, I knew nothing of it. I don’t know if I had even heard of the battle of Payne’s Farm. Both are prominently explained in this book. Unlike my other map books, there were not that many primary and secondary sources to help. I learned so much while writing this book, and I am hoping that others will benefit from this knowledge when they read it. This was essentially a season of “action and reaction.” Where one commander would act and the other would usually retreat. Lee made a bold move here that could have brought on a battle, but Meade would not accept, even if he could assume his favored defensive stand. Meade advanced several times, but Lee would only engage him once—at Mine Run. Meade was ready, but ultimately withdrew without a fight. The actual fights—Auburn, Bristoe Station, Rappahannock Station, Kelly’s Ford, Payne’s Farm, and Morton’s Ford—tended to be small action affairs with relatively few units involved. Yet, they were bloody and important in their own ways. I knew that this book would not as well as my Antietam and Gettysburg map books, but it would need to be eventually undertaken, so why not do it in time for its 150th anniversary.